Blue Ridge Aquaculture, Inc. is the world’s largest producer of tilapia using indoor recirculating aquaculture systems (RAS). Each year, Blue Ridge Aquaculture produces 4 million pounds of tilapia, shipping between 10,000 and 20,000 pounds of live tilapia every day. These fish are raised without the use of antibiotics or hormones, and are free of mercury (undetectable levels from independent studies) and other industrial pollutants. 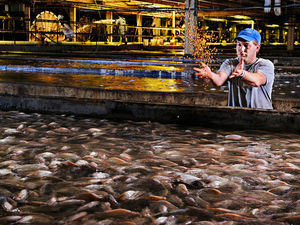 Blue Ridge Aquaculture was founded in 1993, and has been in continuous operation for nearly twenty-five years. Headquarters and operations are located in Martinsville, Virginia. The company operates out of an 100,000 Sq. Ft. facility, and employs approximately thirty-five people. The Company sells live fish to distributors in major metropolitan markets in the North East, such as New York, Boston, Toronto and Washington, D.C. These consumers are primarily Asian and Hispanic-American individuals with a cultural preference for live seafood. Management believes that BRA currently controls approximately 20% of the domestic market for live tilapia. BRA, an Employee Owned Company, operates with a focus on its triple bottom line. From an environmental perspective, the Company believes RAS are the most environmentally beneficial source of protein because of its relatively small ecological footprint, the high water re-use (over 85% of the water is recycled back into the system), and captured effluent with no environmental discharge. Socially, BRA views its workforce as an asset and an advantage, which is reflected in the benefits program it offers. The company has a strong health insurance program for qualified employees, a employee stock ownership plan and pay rates above the regional average. Economically, the company has generated attractive returns, and believes these returns will continue.